I first came to the south of France in my twenties. Then, when my kids were young in the 1980s and 90s we had lots of family holidays in South West France. 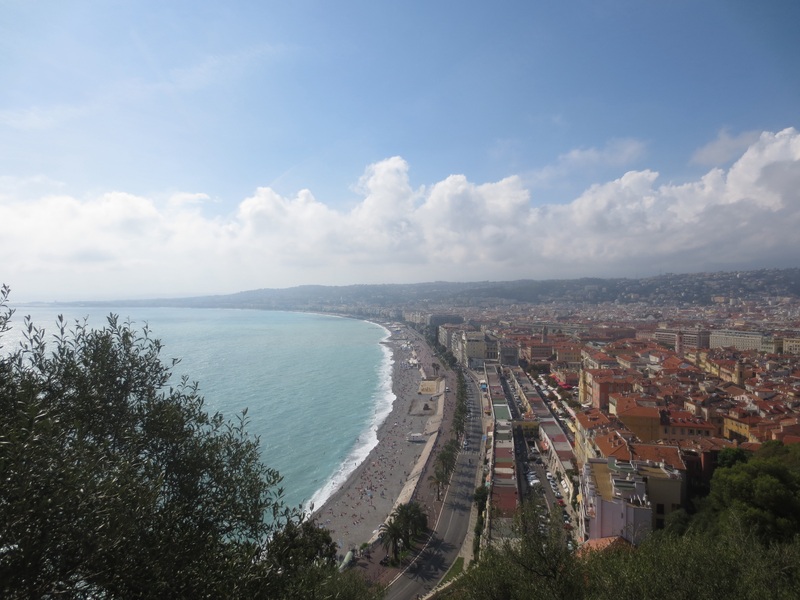 But it wasn’t until 2006 that I visited Nice for the first time on a short holiday with my daughter. I loved it and have been wanting to come back. 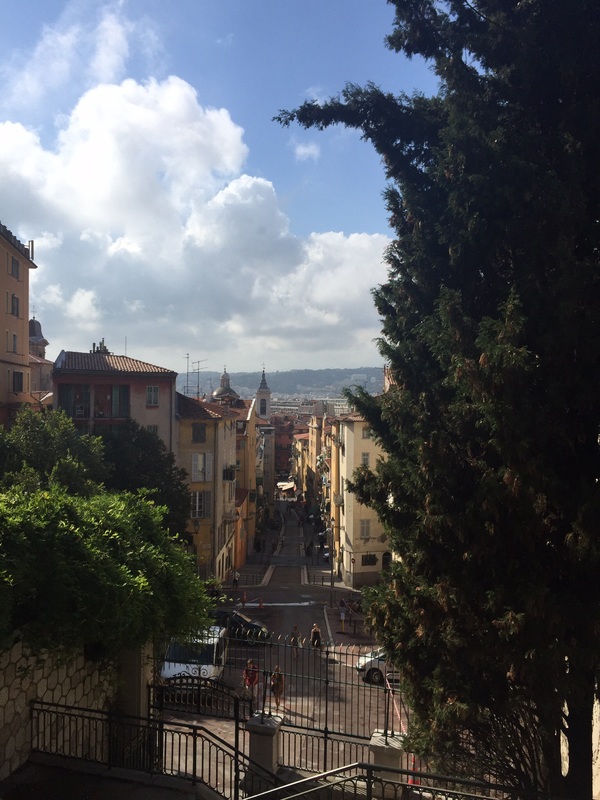 So, finally, here I am again in Nice. I used some of my British Airways air miles for the flight. A bargain in air mile currency at just 9,000 return, and also booked the hotel through British Airways. I get no perks from them for saying this, but living near Heathrow, Terminal 5 is wonderfully convenient and I like the no-fuss arrangement of not having to pay extra for doing things like checking in a bag. I’ve often added up extras that I’d need to pay on cheaper airlines and found BA ends up much the same price. Once we’d landed, it was an easy 20-minute bus ride from Nice Airport for just €6, following the coastal road. 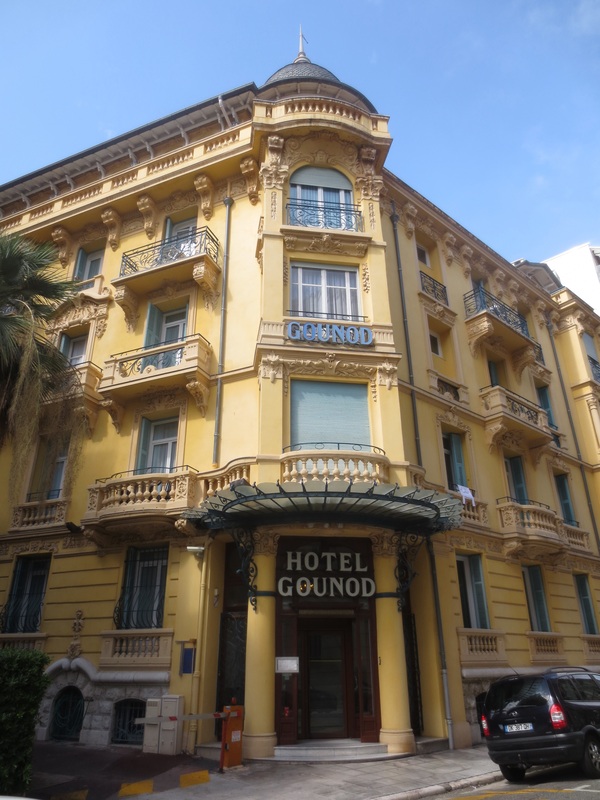 Then a short walk up from the Promenade des Anglais to Hotel Gounod. Built in 1920, it has an elegant Belle Époque facade. The inside is a little more faded (it’s a 3* hotel) but my room is nice enough and the staff very friendly and helpful. I arrived at lunchtime and after dropping my bags in my room headed off in search of lunch. Of course there is only one thing to drink when arriving in the Côte d’Azur and that’s some nicely chilled Provençal rose. 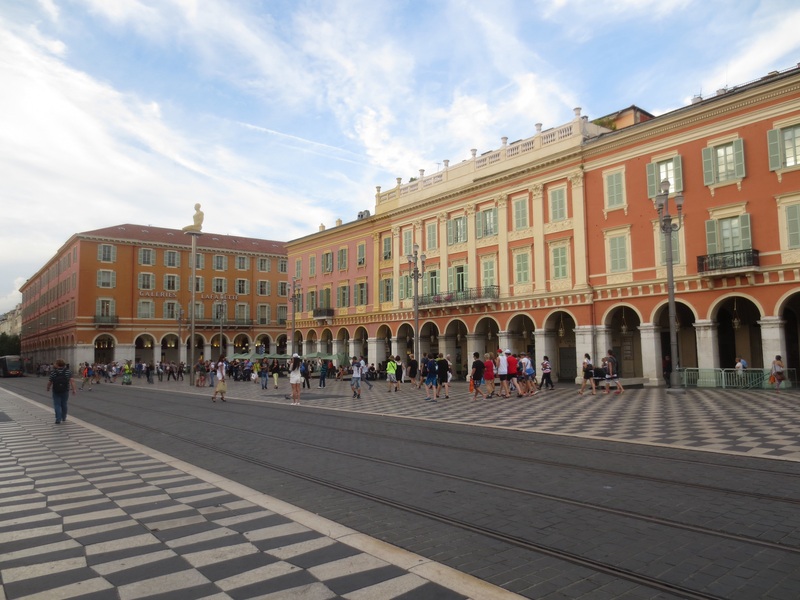 I ate a simple goats’ cheese salad and then wandered on into the heart of Vieux Nice – Old Nice. This is the most exciting and attractive area and with its market in Cours Saleya (Tues-Sun), cafes and restaurants and wonderful food and wine shops. 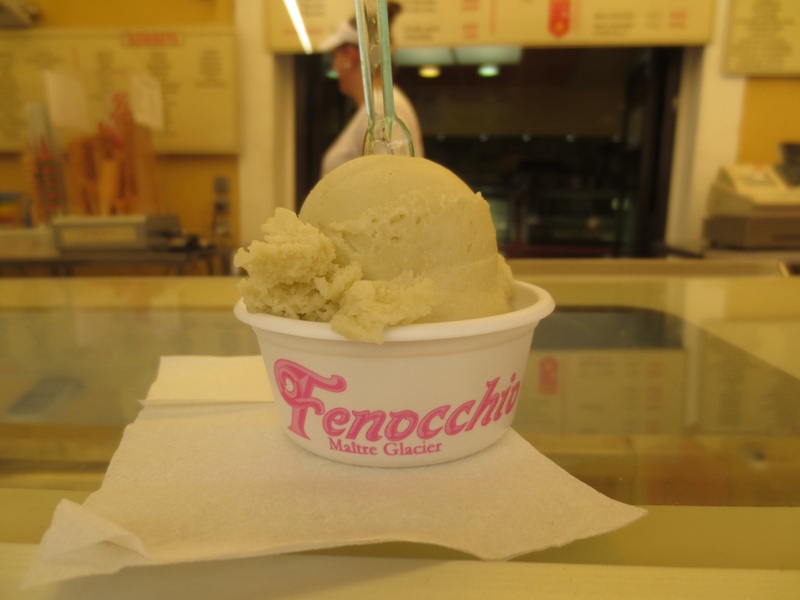 I’d decided to seek out one of the town’s best ice cream shops – Fenocchio in Place du Rossetti. It was very crowded as you can see. They had some wonderfully different flavours of ice cream like lavender, tomato & basil and black olive but I made a more conventional choice of rhubarb and it was delicious; really good and just €2 for a small cup. 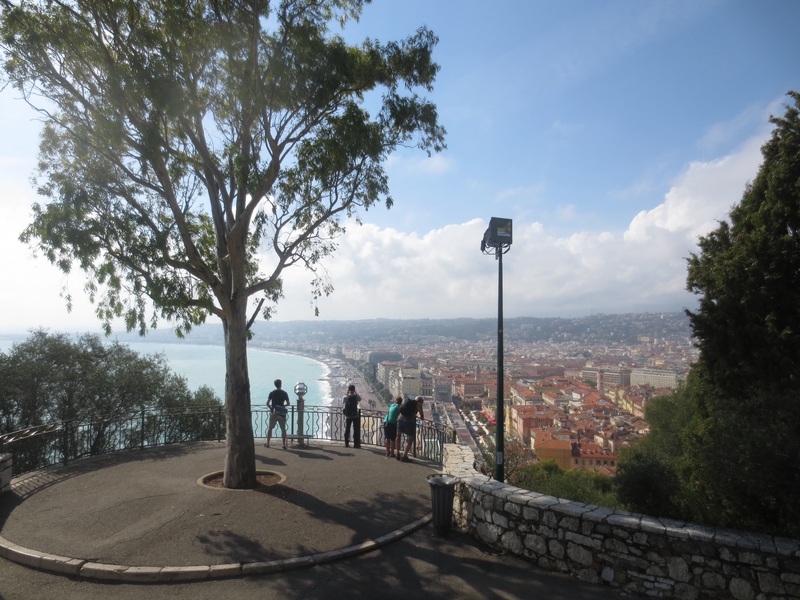 From there I could see some steep steps leading up to Castle Hill from where – I’d read – there was a great view over Nice. It was quite a trek up and I was glad I’d thought to carry a bottle of water with me. But it was worth the effort: the views were stunning. 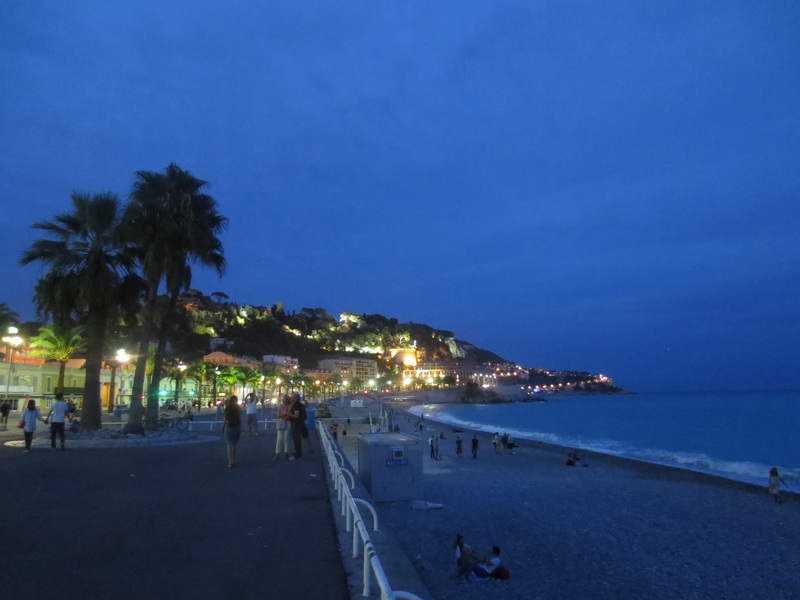 I climbed back down and walked along the Promenade des Anglais back to my hotel for a while. A rest was in order as I’d had an early start. 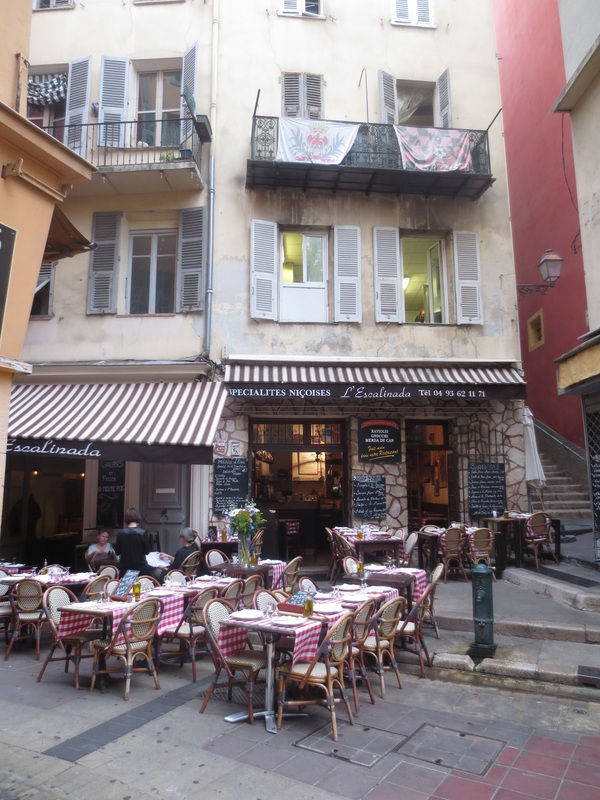 I set off back to Vieux Nice again around 6, having consulted my Lonely Planet and an Insight Guide to Nice for restaurant ideas. The Old Town is such a labyrinth of narrow passageways that my map didn’t work well but my iPhone came to the rescue. 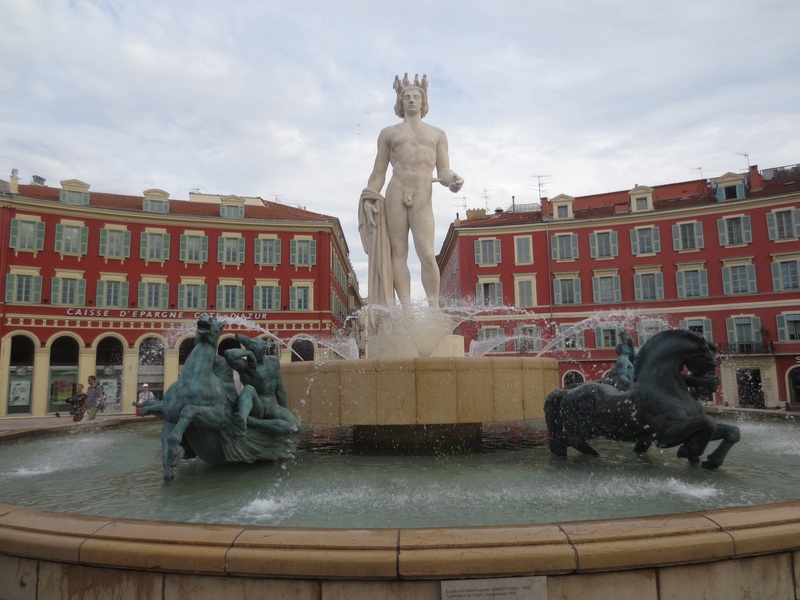 I made my way through Place Massena, which I recognised from my last visit. Then it had been a building site but now was beautifully restored. Finally I reached my destination. Both guides had promised I’d find an excellent typical Nicoise meal at restaurant L’Escalinada. The menu was brought and it was hard to choose as there were so many things I wanted to try but as I only wanted something fairly light I chose Petit Farcies Nicoise – little stuffed vegetables, a local speciality. 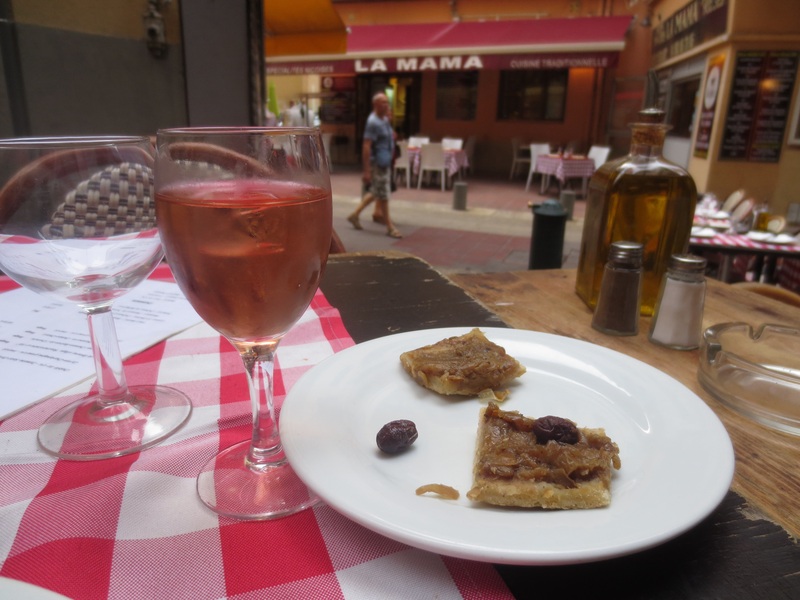 First though, they brought a complimentary Kir and little squares of pissaladiere. 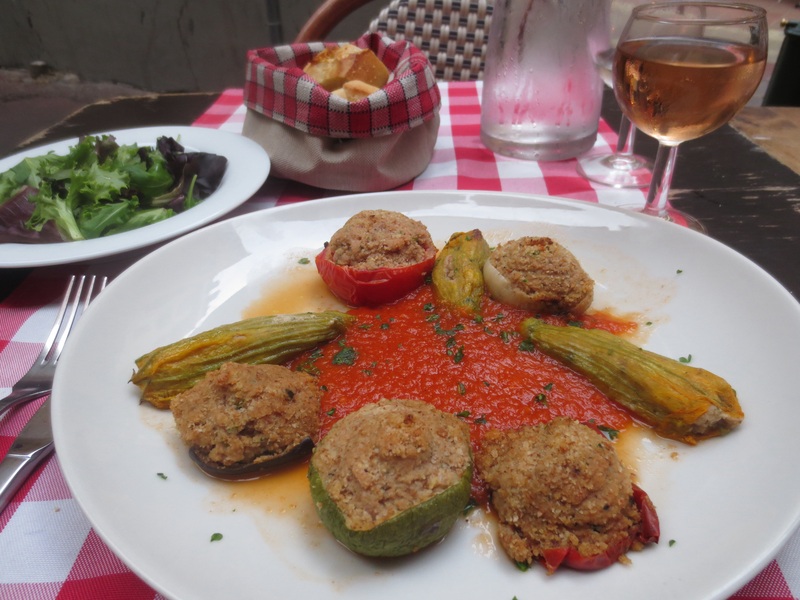 Then my stuffed vegetables came with a gorgeous tomato sauce in the middle and fresh crusty bread and a green salad. They were excellent. There were stuffed courgettes flowers, peppers, tomatoes, onions and aubergine. I was quite full but couldn’t resist a dessert after though. 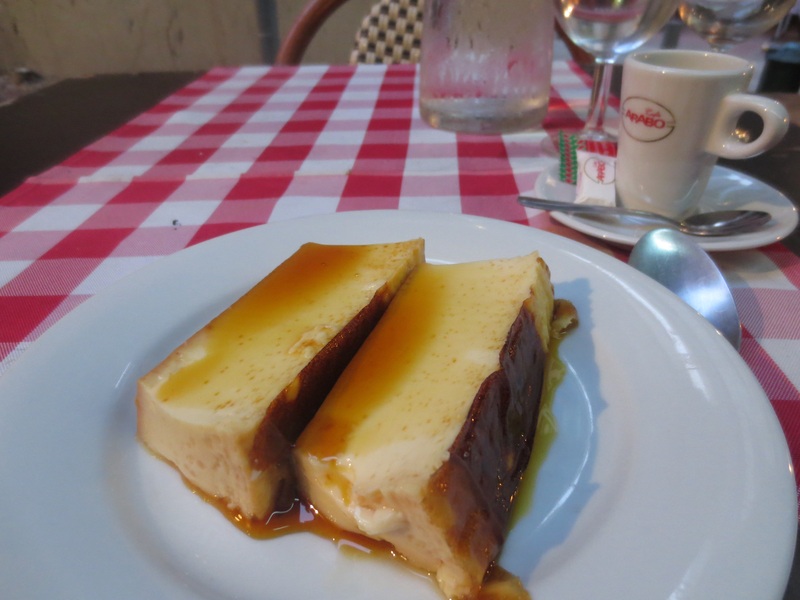 And there are few things more perfect than a well cooked Creme Caramel: gorgeous rich and soft custard and a caramel with the right balance of sweetness of bitterness. It was very good but such a large portion I couldn’t finish it. The food had been as good as promised and the service excellent and friendly. Once I’d paid my bill (€39 for food and a glass of wine) I traced my way back through the narrow roads to Cours Saleya and on to the seafront. It was lovely to walk along the seafront for a while. The view along the Promenade des Anglais and the glorious colour of the Mediterranean Sea here always makes me think of Raoul Dufy paintings, so I must go in search of some. But meanwhile a reasonably early night was needed. Tomorrow I’m booked on a three and a half hour walking food tour of Old Nice, starting at 10am, so energy will be required! What a lovely post! 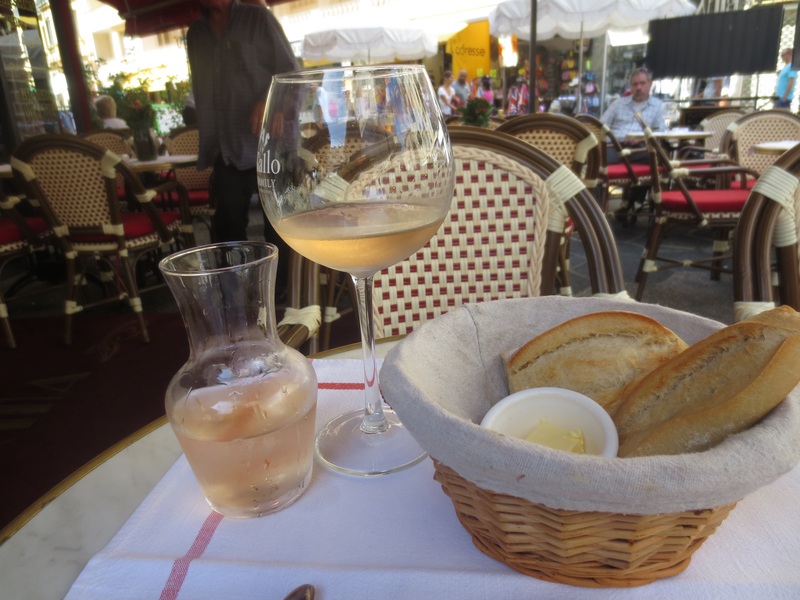 I can’t believe you got a kir and some pissaladiere! wow! your meal looked so good. I first thing I ever had in Nice was a Nicoise salad, and the second was pissaladiere! 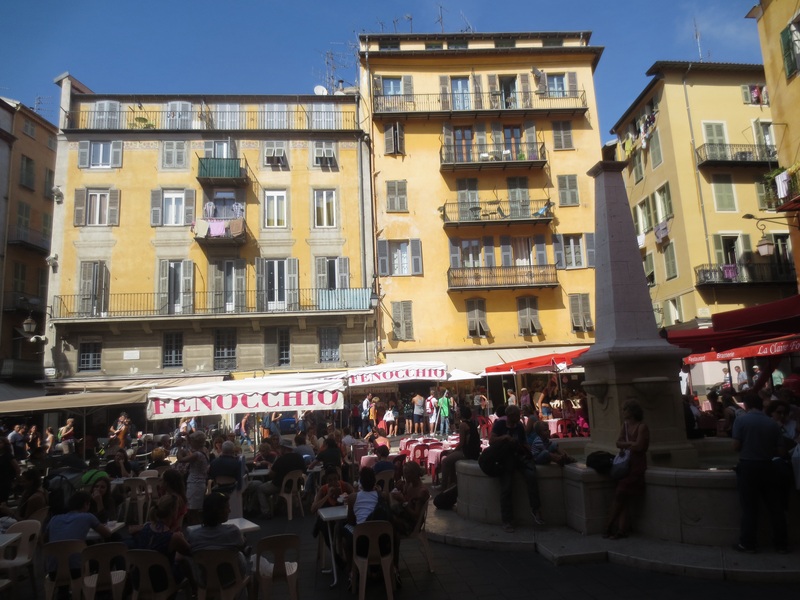 Loved vieux nice – with all of the colors and Italian influence.